Like the explorer Marco Polo, students often find themselves heading toward points unknown and in directions they might never have anticipated. Julia Abelsky ’17 is fascinated by the way light scatters as it bounces off surfaces. Three years ago, she read an article that suggested that invisibility was within scientific reach. And that’s when her fascination turned into determination. “I wanted to see how I could control the pathway of light,” says Abelsky, who set off on a quest to make Harry Potter’s invisibility cloak a reality. 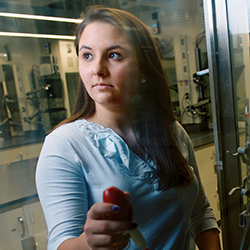 While still in high school, she began reading everything she could about nanotechnology and nanoscience. She soon secured an internship at a nearby college, where she learned to operate multi-million-dollar atomic-force and scanning-electron microscopes. Eventually Abelsky created a large molecule — a diblock copolymer — with unusual refractive properties, which she used to engineer a nano “cloaking device” that renders tiny particles invisible. The Weinberg College freshman has since won more than 40 awards for her work, including second place at the Intel International Science and Engineering Fair. Her research has broad applications for a variety of fields, including telecommunications, deep-sea sensors, medical diagnostics, defense and optics. Abelsky’s pursuit, unique as it is, is not unlike the journey undertaken by countless others in the thirst for knowledge. It begins with a question that begs not only to be answered but explored from every possible angle. From there the search moves outward — to points unknown and in directions the seeker might never have anticipated. Along the way, the student often generates knowledge that takes on a life of its own, creating solutions, posing new problems and spurring even more questions for others to explore. This place between the seen and the unseen is the scholar’s natural home and the launching point for students and faculty at Weinberg College. For each, the path begins with curiosity — and a question. But not just any question. Only the right questions — penetrating, thoughtful and inspiring — will lead students down the path. Shaping those questions can be a challenge. “With Google at our fingertips, it’s easy to assume we now know all the things we wanted to know,” philosophy Professor Sanford Goldberg says. Lifelong educator Mel George ’56 agrees. A former president of St. Olaf College, interim president at the University of Missouri and a math professor, George has spent the better part of his career thinking about learning: what inspires it, drives it and makes it productive. “Nothing really great in human inquiry has emerged simply by ‘answering the questions,’” concludes George, who chaired the National Science Foundation’s mid-1990s review of undergraduate education in math, engineering and science, as well as a statewide initiative in Missouri to strengthen learning outcomes. Students, George says, should learn how to ask more smart questions, rather than answer routine ones. Curiosity is the engine of learning, he says, and schools should spend more time spurring that drive for discovery. One way to do this, George says, is to teach skills in two different kinds of thinking: convergent, where students identify a single best answer among many choices; and divergent, which generates multiple possible answers. That’s what happened to Emerson Gordon-Marvin when he took an African American Studies class taught by Professor Barnor Hesse. The 2012 graduate experienced “dumbfounding awe” as Hesse led the class through a close reading of Racism: A Short History by George M. Frederickson. Hesse unpacked numerous contradictions in the noted historian’s 2002 book, which examines racism in America and anti-Semitism in Europe. The inconsistencies revealed that the author, a distinguished historian and Pulitzer Prize finalist, was defining racism in conflicting ways. Such discernment, Gordon-Marvin says, is invaluable in a world where the gap between language and action is wide. Today, as a contract political researcher, he is particularly attuned to rhetoric related to racial and economic disparity. For Andrew Levin ’12, the “a-ha” moment came during his sophomore year, in an American Studies course called “High School in America.” The epiphany occurred under decidedly wonkish circumstances, but felt like a lightning bolt nonetheless. “We were discussing shifting management structures and their economic impact on the institutional framework of American high schools in the 19th century,” Levin recalls. His classmates were more interested in other aspects of the topic, but Levin — who had long had an interest in economics, finance and American history — had found his niche. He dove deeply into the subject matter and gained a profound appreciation for the ways financial markets have influenced America’s cultural history. The experience led him to major in American Studies, a discipline that bridges the social sciences and the humanities. The broad scope of the program spurred him to explore “outside-the-box” ideas to develop his own intellectual identity. He signed up for courses he otherwise would not have considered, such as Russian literature and art history, and discovered connections between seemingly disparate fields. A close reading of Dostoyevsky’s The Idiot, for example, yielded insights into the ways artists and writers make sense of the institutional foundations of society. An art history course that scrutinized the design of late 19th-century stock and bond certificates helped Levin appreciate the attitudinal shifts wrought by the Civil War and the 1876 Centennial Exposition. “Purely by looking at the certificates’ designs and the references in the drawings, I began to understand the sentiment and thought processes associated with the country’s financial structures during this time,” says Levin, who is now an investment analyst in New York City. This experience of wonder and the active engagement it inspires are uniquely valuable in an era when students are pressured to optimize and specialize their learning. “The data indicate that, during your life, you will have seven different occupations — perhaps totally different ways of earning a living,” says George. “That’s not like my father, who worked as an accountant for 60 years. Most people today are in occupations that didn’t exist 30 years ago. That versatility may be even more important today, as technological innovation places a premium on adaptive agility. What’s more, the nature of reality seems faster, altering how we live and learn. These trends may seem to be at odds with the traditions of the arts and sciences — the close reading, reflection and sustained discourse that yield deep and deliberate thinkers. But it is a challenge the College is meeting forcefully through initiatives such as the Northwestern University Digital Humanities Laboratory, which is developing coursework that uses technology to deepen those skills. But Kramer believes that technology can foster rather than undermine those skills, and he designed a course, Digitizing Folk Music History, to explore that potential. The class immerses students in one of the University’s archival collections — the images and recordings of the Berkeley Folk Music Festival. The festival ran from 1958 to 1970 in Berkeley, Calif., and the 30,000 artifacts in the archive include unpublished photos and music by some of the most iconic artists of the era: Pete Seeger, Doc Watson, Jefferson Airplane and others. Students in Kramer’s class have learned to mark up the artifacts and rework them into new frameworks, a process that forces them to examine the material carefully as they make decisions and interpretations. The students then move on to advanced strategies, such as statistical analysis, timeline building and geocoding maps. They even remix audio and manipulate images to ferret out deeper patterns. In doing so, a new generation discovers meaning in the stories of the past. 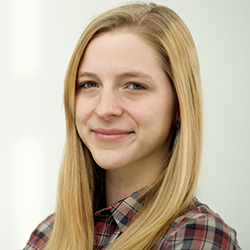 For history major Jessica Smasal ’14, the course was an “incredibly transformative” experience. She created an inter-active website that explored the influential musician Joan Baez through text, video, music and images. The thesis she ultimately developed extended well beyond the artist to include conceptions of motherhood in the 1960s. “I am large, I contain multitudes,” Whitman wrote in “Song of Myself.” His classic poem spills over with enthusiasm, epiphany and engagement — qualities all associated with the arts and sciences. “What the liberal arts do — and this is currently under pressure from external forces — is encourage us to think in a non-instrumental way about the world — to wonder about it, to read, write, sketch, experiment, and talk intensely about topics and to have an adventure of the mind,” Kramer says. In the pursuit of this adventure, humans move from the known into the unknown, the seen to the unseen. The results are often unpredictable. “Because later discoveries depend upon earlier ones, the most exciting thing is that we never know exactly where a project will lead us,” Northwestern astrophysicist Adilson Motter says.